Kindle Application will help users to read eBooks in iPad, change font size, Adjust Brightness, go to any line, bookmark pages and add notes. All this data will be in sync with Amazon Cloud, this means that users can access this information anytime from devices like iPhone or Amazon Kindle. The application works on both Landscape as well as Portrait mode and users can search for kindle book right from iPad Safari Browser. 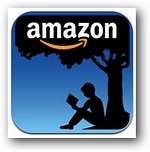 One of the attractive features of Kindle app icon is the sky behind tree under which a boy is reading a book keeps on changing with time of the day. Kindle is an Universal application and works on both iPhone as well as iPad.